I’ve been hearing about Let’s Encrypt for several months now as an up and coming replacement for standard SSL Certificates from vendors like Comodo, Thawte, GeoTrust and the like. To be honest, at first glance I was not impressed. Let’s Encrypt certificates only have a lifetime of 90 days, and a simple Comodo cert can be had at SSLs.com for $15 for 3 years. So why go through the hassle? I’m a huge fan of LiquidWeb. They are hands down the best web host I’ve worked with since I started developing websites in 1995. And, as usual, their tech support team came through with the right answers and a simple process for setting up Let’s Encrypt on my VPS. In just a couple of minutes, LiquidWeb support had AutoSSL set up in my VPS’s WHM. And they added a cron job so that the certs would autorenew every 90 days with zero work for me. 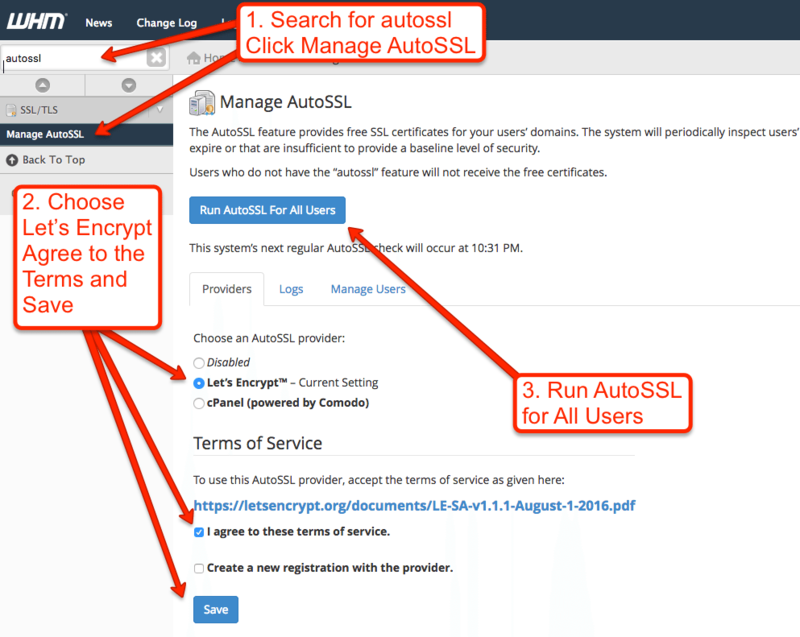 Once AutoSSL is set up, you have to do a few things to get Let’s Encrypt working on your server. See the screenshot above for the details. In most cases, moving a WordPress site to SSL is a pretty simple process. Following the steps below will be all you need to do in many cases. 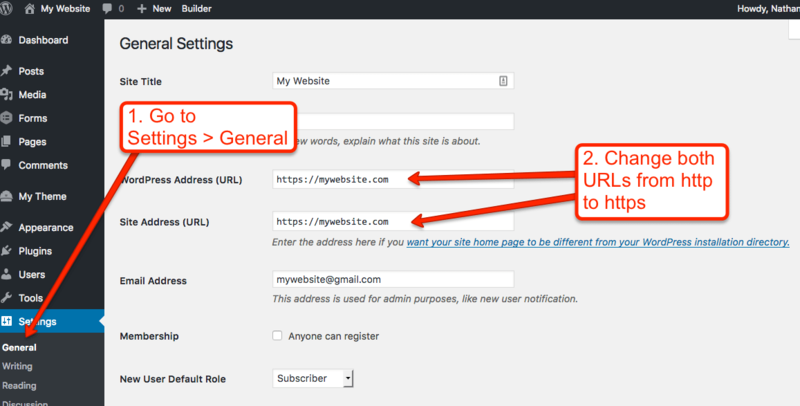 Go to Settings > General and change the WordPress Address and Site Address from http to https. You’re probably going to get logged out a couple of times during this process as the site goes into SSL. That’s totally normal. The easiest way to do this is by installing and activating the WP Force SSL plugin. Other Plugins like iThemes Security Pro also offer a force SSL function. Or you can force SSL via your .htaccess file. The last step in the process is to update all the instances of the http version of your domain in your database, which will be found in internal links, images, and other media. 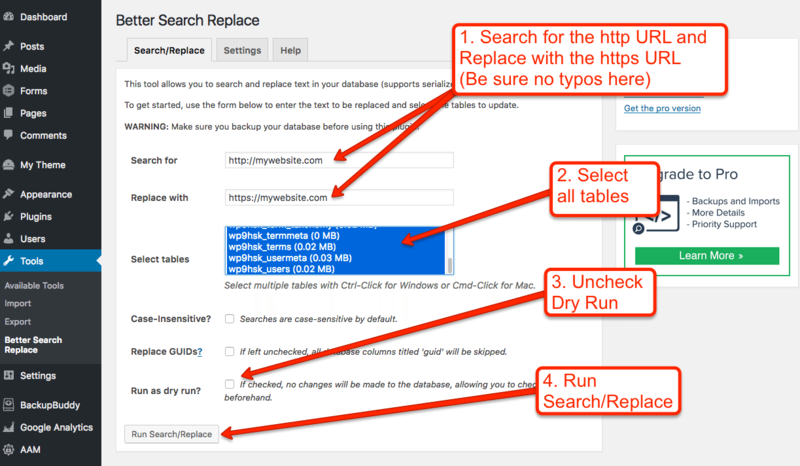 To do this, install and activate the Better Search Replace plugin and follow the instructions in the screenshot below. You can often find the issue by right clicking, selecting View Source to view the HTML from the page, and searching for http://. Anything coming in via http rather than https will cause you not to get a green padlock. Each instance will need to be fixed. You might also try the excellent Why No Padlock? tool. To make sure everything is working properly with your new SSL certificate, go to the SSL Server Test, enter your URL and wait while this free tool gives your SSL certificate a thorough check. If you get bad results, talk to your web host and ask for assistance. Hi.. I did this and I can’t access my WP admin login page anymore..
and the https on the address bar appears twice.. Help.. Sorry you’re having this trouble. What you’re describing sounds like a server issue. I’d suggest talking to your web host to see what they can do to assist.